Geneva Runkel Henss, 101, of Moline, Illinois, long-time nurse and community leader, died Saturday, September 19, 2009, in Rosewood Care Center, Moline. Services are 11:00 a.m. Saturday, September 26, 2009, at Union Congregational Church, Moline, where she was a member for over 90 years. The Reverend Randy Heckman is officiating. Visitation is 5:00 to 8:00 p.m. Friday at Trimble Funeral and Cremation Center, Moline. Burial is in Moline Memorial Park. Memorials may be made to the Left Bank Art League. The former Geneva Aileen Runkel was born September 4, 1908, in Jacksonville, Illinois, the daughter of Cleveland and Myrtle (Barnett) Runkel. She married Paul Henss in 1930, in Moline. He died in 1981. She graduated from the Lutheran School of Nursing, and after a few years as a private duty nurse, was a Moline Visiting Nurse for ten years. At age 45, she enrolled at Augustana College. She earned a Bachelor of Science degree and also attended health education courses at the University of Minnesota and University of Chicago. She was the Moline High School Nurse for 22 years. 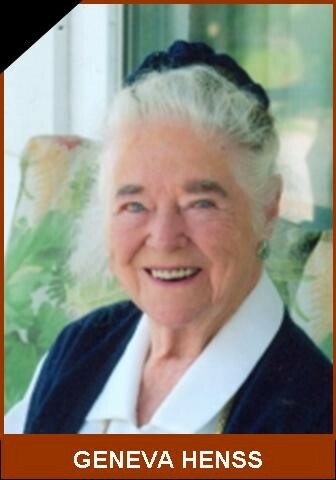 Geneva was a lively lady who lived in Moline for a long time and participated energetically in a wide variety of activities. She was involved in gardening, politics, nursing, education, assisting young people, painting, church activities, raising a family and many organizations within her community. She loved to sing. Also, she liked to yodel, and from time to time, was called upon to do that at various gatherings. At times over the years Geneva was a member of the Moline Women’s Club, Moline Historical Society, Moline YWCA Board of Directors, Republican Women’s Association, President of the Lutheran Nurses Alumnae, Chairwoman of the Quad Cities Public Health Nurses Organization, Vice-president of the Illinois School Nurses Association, Retired Teachers Association, President of the Parent Teachers Association, Left Bank Art League, President of the 5th District Nurse Association, Illinois Conference on Children and Youth, and the White House Conference on Children and Youth. She received a 30 year award for her volunteer work as a Red Cross disaster nurse. Geneva became interested in art at an early age during her school years. In her later years, she renewed her interest in painting. After retirement, she took art classes at Blackhawk College and became an active member of Left Bank Art League. She participated in art seminars and art exhibits, and her paintings provided pleasure to many and continue to do so. Geneva loved to paint. She also loved her family and the young people of the community. She will be missed by many. Geneva is survived by a son and daughter-in-law, Donald and Joline Henss of Colorado Springs, Colorado, a daughter, Virginia Geis of Lombard, Illinois, a daughter-in-law, Marion Henss of Centennial, Colorado, 12 grandchildren, 20 great-grandchildren, and 2 great-great-grandchildren. She was preceded in death by her husband, Paul Henss, a son, Robert Henss, a son-in-law, Robert Geis, a brother, Sylvan Runkel, and a sister, Dorothy Martin. Following the death of her husband, Geneva continued to live in the family home. However, she fractured a hip and was confined to a wheelchair in recent months. The family is very appreciative of the months of care given to Geneva by the nurses and staff of Rosewood Care Center. The family invites you to share stories and condolences and light a candle in Geneva’s memory at www.TrimbleFuneralHomes.com. Mrs. Henss was a wonderful friend to Moline High School students for many years. I was grateful for her fantastic back rub downs to get me ready for football and baseball games. Nice lady. Looks like she lived a great full life. It couldn't have happened to a nicer person.